Want to get your milk straight from the cow? It's been a long time coming, but the Xbox One X is finally gearing up to launch in Australia on November 7, 2017. Set to be the most powerful console ever seen, the Xbox One X is bound to be in high demand at launch. While third-party retailers have offered pre-orders for a few months now, the standard 1TB version of the unit has so far been absent from Microsoft's own official Australian online store – until now. 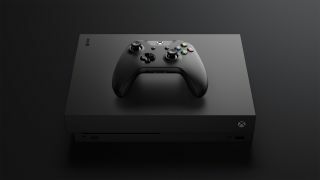 As of today, you can now secure a unit from the Microsoft Store starting, with Australian pre-orders for the Xbox One X opening early this morning. Priced at $649, the Xbox One X comes with a 1TB of storage, an Xbox Wireless Controller, a 4K-capable HDMI cable, a 14-day Xbox Live Gold trial and a 1-month Xbox Game Pass trial. If you're keen to pick one up, we'd advise heading over to Microsoft's Xbox One X pre-order page right now. And you might want to get in quick, as Microsoft reckons these pre-order units may sell out. Along with the Microsoft Store, the Xbox One X is also available for pre-order at major retailers like EB Games, JB Hi Fi, Big W, Target, Harvey Norman and The Gamesmen.